Nuuka collects and processes data on energy usage and indoor air quality in residential, commercial and public buildings. Their intelligent analytics platform helps building managers to identify and eliminate inefficient energy usage. Nuuka is a software platform that helps property managers to monitor energy usage, indoor air quality and sustainability. In addition to individual commercial properties, Nuuka software is appropriate for property investors, municipalities, and residential building companies because the platform allows for centralised management of data from multiple sources. The software collects data from pre-existing building technologies, such as energy metering systems, and integrates it into their analytics platform. Using the platform’s easy-to-use data visualisations, building managers can take a smarter approach to cutting energy usage and managing indoor climate in their properties. In addition, all analytics can identify and alert property managers in the case of irregular usage, allowing for instance, for immediate identification of faults. With these advantages, Nuuka estimates that their existing customers have enjoyed energy reductions of up to 35%. 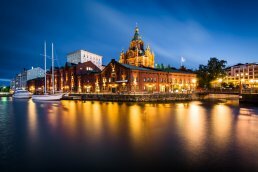 In mid 2018, Nuuka won a tender to implement smart building management systems in around 1000 public buildings in the City of Helsinki, helping the city to reach its goal of carbon neutrality by 2035. In Europe, buildings account for about 40% of total energy consumption and 36% of total CO2 emissions. Smart building management software can help property developers and managers to pinpoint inefficiencies, and reduce energy consumption and overall CO2 emissions from buildings. Smart monitoring software allows building owners to identify and address energy inefficiencies, contributing to improvements in energy efficiency. By centrally managing data from multiple sources, Nuuka’s software can help municipalities like the City of Helsinki to manage energy usage in public buildings and reduce the environmental impact of cities. Nuuka is a Finnish software company that makes buildings smart. They create building management tools that utilise big data to optimise energy usage, indoor air quality and sustainability.